This is the second album in a row where Clapton experienced difficulties during the recording process. When it occurred in 1980 he responded by dispensing of the services of producer Glyn Johns and uprooted his band from a studio in Surrey to a studio in the Bahamas. This time he personally met with each member of his band (guitarist Albert Lee excluded) to inform them that their services would no longer be required. Reportedly Gary Brooker took this decision very hard while keyboardist Chris Stainton was later invited to rejoin the band after he sent Clapton a letter supporting the decision. Subsequently slide guitar ace Ry Cooder and the respected rhythm section of bassist Donald "Duck" Dunn and drummer Roger Hawkins were brought in for the sessions which, like "Another Ticket" were produced by Tom Dowd. For his part, Clapton had written a number of new songs earlier in the year (while staying at a rented cottage in Wales) which reflected his current status with Patti as well as his state of mind following treatment for his alcoholism. Clapton was allegedly moody and uncommunicative during this time as he sorted through his feelings concerning sobriety, his marriage and his career. While the material that he came up with did not rank among his best work, the compositions were well constructed and melodically strong despite their lyrical banality. Things proceeded smoothly when sessions resumed at Compass Point Studios in Nassau. Clapton and Ry Cooder's slide guitar work on such as tracks as "Everybody Ought Make A Change" by Sleepy John Estes and E.C. 's own "Man Overboard" is tasteful and technically flawless. "Pretty Girl", written by Clapton, features a beautiful melody capped off by an excellent acoustic guitar solo by Albert Lee. Clapton and Lee also engage in a good natured guitar duel on "The Shape You're In" where a sober E.C. offers advise to Patti concerning her own drinking habits. "Ain't Going Down" (melodically reminiscent of Bob Dylan's "All Along The Watchtower") features a fiery Bobby Blandish chorus and a driving guitar solo. Clapton pays homage to Albert King on "Crosscut Saw" with his riveting guitar work accented by dynamic string bends while Dunn and Hawkins aptly demonstrate why they enjoyed such sterling reputations. The playing on the aforementioned tracks as well as elsewhere on this album is consistently good but rarely invigorating. There is little to say about the insipid "I've Got A Rock n' Roll Heart" while tracks like Clapton's "Slow Down Linda" and "Main In Love" along with "Crazy Country Hop" by Johnny Otis are mildly entertaining at best. "Money and Cigarettes" (two things which Clapton reminded himself to take as he left the house) sounds as though it was put together by a group of seasoned studio professionals. It is a well constructed, polished album by a veteran musician. 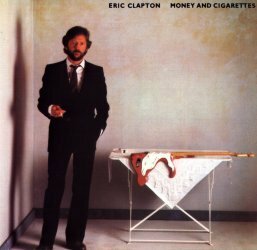 While it is not a "classic" Clapton release, "Money and Cigarettes" is quite good and catches Clapton in transition from the laid back musicologist of the 1970's who wore his influences on his sleeve through the man struggling to redefine himself in the early 1980's to the more overtly commercial AOR artist of the late 1980's. Interestingly this is the first album to be released on E.C. 's own "Duck" label although stylistically it strongly resembles his previous RSO releases. This is a tighter, more focused album than "No Reason To Cry", with better material than "Backless" but it suffers from the lack of strong anchoring songs like "Slowhand" and seems constrained by the tight professionalism of the music. From an historical perspective it would have better if Clapton had waited to record this album until the following year when his playing showed strong evidence of having regained the intensity of his earlier work as displayed on his 1983 American tour, his superb contributions to the Roger Waters sessions producing "The Pros And Cons Of Hitchhiking" and the London and U.S. ARMS concerts with Jeff Beck, Jimmy Page, Steve Winwood, Joe Cocker, Andy Fairweather Low, etc. Although I rate this album approximately the same as "Slowhand" and "Backless", my specific recommendations would follow this descending order;1. SLOWHAND - Examples of excellent material coupled with strong performances on several tracks.2. MONEY AND CIGARETTES - The music is consistently good but the material is not as strong as that featured on SLOWHAND.3. BACKLESS - Solid material overall, intermingled with occasionally inspired musical moments. This CD is not one of his most worthy efforts. It depicts EC at a time when he has lost his edge and is very mellow. His style is laid back. It starts with a good blues song "Everybody outta make a change. It is the only blues effort on the CD and warrants a listen. "The shape you're in is next. It has a nice rhythm feel and is again worth a listen. "Aint going down anymore is a song that in my mind has little to offer, "I've got a Rock and Roll heart is next and was the song that EC used as a single. It is a good effort, however not great. "Man overboard is another mildly effective song again not much to write home about. "Pretty Girl" is next and is probably the best effort on the CD. It shows EC at his best or at least what can be his best. It has the same feel as Badge or Opposites from other CD's. The remaining 4 songs are rockers that lack conviction and have no drive behind them. This is an album for collectors like myself. This is the album that started it all! "Pretty Girl" is a great song "Crosscut Saw" lot better then Stevie Ray's version "The Shape You're In" Good vocals Wonderfully done. This is a good record from Eric as "professional rock musician." Long-time producer Tom Dowd and Clapton assemble a great bunch of musicians (including fellow guitar-greats Ry Cooder and Albert Lee) and lay down a solid, well-honed bunch of tunes. Highlights include the beautiful ballad, "Pretty Girl," the Clapton-Cooder slide workout on "Everybody Oughta Make a Change," and the powerful, chugging groove of "Ain't Going Down." Although, being a little too polished, this record doesn't have the emotional depth or intensity of Eric's best work, its still highly enjoyable. Clapton is the man and if you don't agree well you don't know music. Because not only does he tear up the guitar he has vocals also.. Like I said CLAPTON IS THE MAN! Money Cigarettes is a great example of Clapton's developed voice, still a little thinner than it is today but his voice has the pain and feeling of a man that has been broken countless times. "Pretty girl" does stand out as a masterpiece in the middle of the albums song list. Crosscut saw definitely shows how big a fan of Albert King Clapton is. If you listen to "born under a bad sign" from about 15 years earlier you notice hoe similar the solo's are. Funny enough the star studded band on the album is the flaw. Duck Dunn and Ray Cooper give the album the dirt it needs but the drumming is too robotic. Its sounds like a drum machine and lacks soul. But this album shows Clapton on his way back to the top, and features some good country/rock songs.